It’s All About The Flags! My living room is always Memorial Day ready! 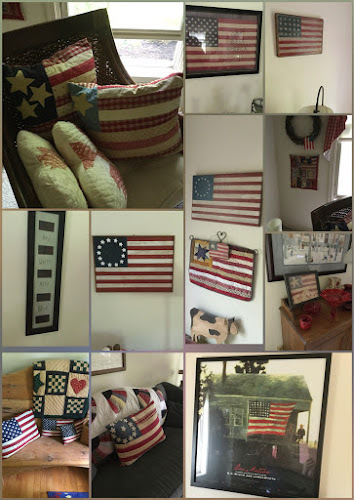 I have collected flag stuff forever…although I have stopped collecting anything right now! I have a little too much of everything! Books And Cookies! Well…Actually One Cookie! Hope you're enjoying the holiday. One of our neighbors and her adorable grandkids made me a flag and brought it down this morning. I hung it on our front door and I love it! I love all the transformations of the US flag – Americana at its best! You are ready for Independence Day! Hope you enjoyed a peaceful weekend! Hugs. I do love your flags! Thanks for sharing, and hope you had a great day. Thank you! I hope you had one, too! You have a very nice selection. Thank you for watching my podcast. I had fun making those bookmarks.